I finished the first sleeve for this a couple of weeks ago, amid much lamenting and whinging and complaining, as is my wont. Nobody wants to be knitting angora in the biggest heatwave the country has seen since 1976. I promised myself a new linen cast on after the first sleeve was done. Well, then we went and had the floor done in the living room, which accounts for roughly three quarters of the square footage of the ground floor of our house. The contents of said room are still stuffed into the spare room. Behind it is all my yarn. 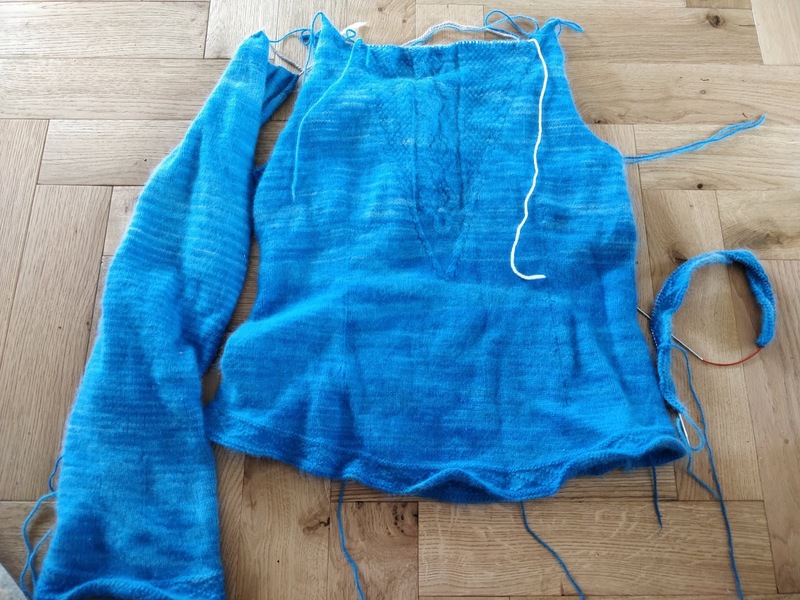 So, it was either cast on the second sleeve or not knit at all. I put it off for two weeks, but the second sleeve is now on the go, as you see on the right of the picture. I wouldn't have time to finish a new linen for this summer anyway, although was I was wearing this yesterday and thinking how much I'd like another one.